This was our craziest weekend of 2006: we were conventioneers, TV stars, and hosts of a humongous Halloween party! Every day we finished one thing just in time to rush off to the next. We’re still not sure how we managed all this in a mere four days. Read the deets below, and click on the pix for more photos of each event. Above: That's our table at the Stumptown Comics Fest, and the start of Anina’s brief trip to celebrityland. 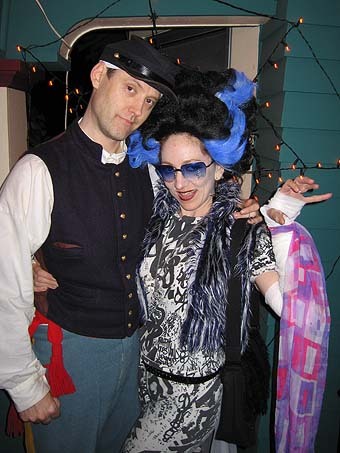 Below: Your hosts for the 11th annual Halloween on Hawthorne, Billy Blueback and the Bride of Funkenstein! Above: Suffering Sappho! Anina gets to meet her hero at Wonder Woman Day. On Friday, Anina took time off from her day job so we could finish prepping for the party. In the afternoon we picked up our keg, then headed for the Oregon Convention Center to set up for the first day of the STUMPTOWN COMICS FEST. Not long after the hall opened, we were stunned to see our old friend Bob Schreck, currently a Vertigo editor, saunter through the door! He flew in from New York for our party and built a vacation around it. A few other luminaries dropped in to the convention unannounced, including Scott McCloud and Matt Wagner. Friday night: more party prep work. Saturday: Up earlyish and off to the Convention Center for day two of Stumptown. 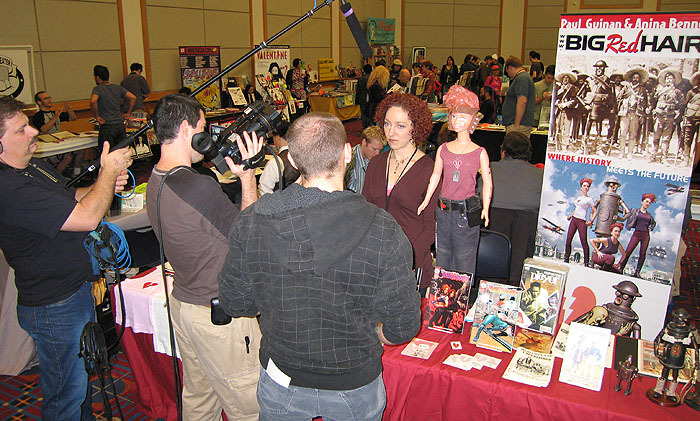 A camera crew showed up to interview Anina for a documentary TV episode about Wonder Woman fans. Some of our friends were shanghaied for on-camera interviews too: Shannon Wheeler and Lois Buhalis. We’re glad they’re still speaking to us. Saturday night we dashed home as soon as the convention closed, picking up some takeout on the way. Another old friend, Dave Seglin, was visiting from Chicago and came early to help with last-minute setup. Anina was still slapping on her makeup when the first guests arrived, and the lovely Liz Wolfe (aka DJ Flutterby) helped put the finishing touches on her costume. Our HALLOWEEN PARTY was a smashing success as usual, plus it turned into the unofficial after-party for the Stumptown convention. Just about everyone wound up at our place: Scott, Schreck, Jim Valentino (who recently moved in across the street from us), Charles Brownstein, Kazu Kibuishi, and con organizer Indigo Kelleigh. It officially ended at 6 a.m.later than we’d planned, but at least we got to set the clocks back to 5 a.m. right away. Sunday: sleeping/recuperating, then housecleaning, then we spruced ourselves up and went to Excalibur Comics for WONDER WOMAN DAY, a very successful charity auction organized by Andy Mangels. Andy is the other Wonder Woman fan being profiled by the TV crew, so they were at the shop for most of the day. Anina bravely decided to go in full geek mode, wearing a Wonder Woman cape made by Don Hood, Andy’s partner. 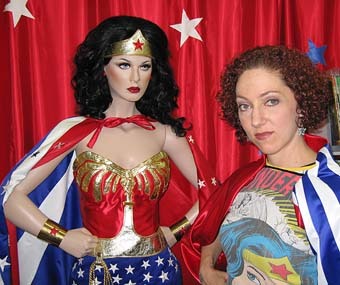 Don also crafted the elaborately detailed replica of Lynda Carter’s costume for the mannequin shown in the photo at left. Sunday night: more cleaning. So much cleaning. On Monday morning the TV CREW ARRIVED TO SHOOT ANINA, her Wonder Woman collection, interview her some more, interview Paul, interview her brother Nick, and shoot us working at home together and doing domestic stuff. They wrapped it up just in time for us to go meet Schreck and Shannon Stewart for dinner. Whew. Boy, is our dog happy that’s over! Anina was even relieved to go back to her marketing job on Tuesday.